For this exercise I had to draw the negative space around an object. 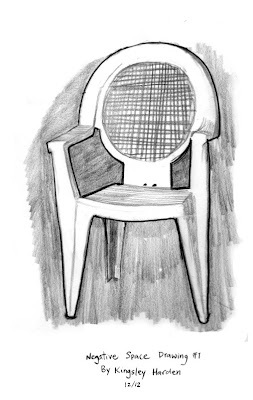 After I drew the space around the chair, I filled in the chair details. I did this kind of quick while watching Home Alone 2, so I may do another. 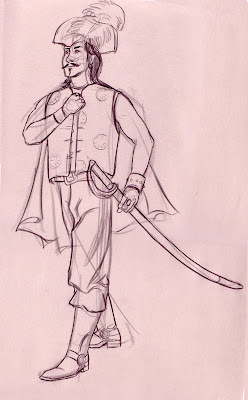 For this exercise I had to use a hand drawn on transparency from the last exercise, transfer it to paper and render it. 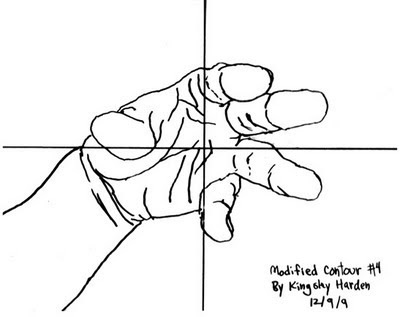 I redrew a hand on the overhead transparency. 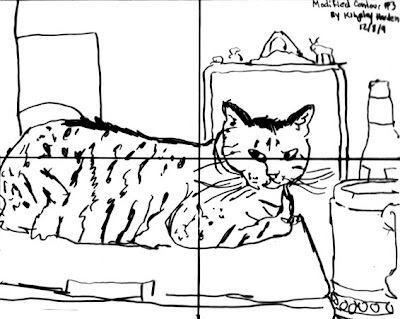 Taped a piece of paper to a drawing board and with a ruler marked the dimensions of the transparency, including the horizontal and vertical lines. I toned the paper with a 4B graphite stick. 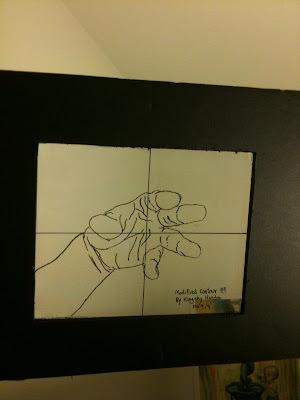 I looked at the transparency and did a rough sketch of the hand onto paper. 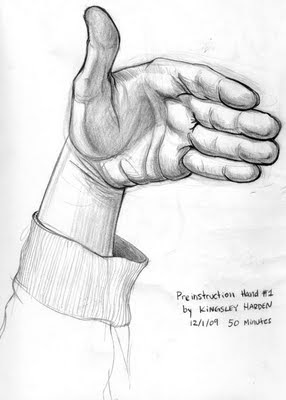 After the rough sketch was finished, I posed my hand in that position and drew it for the next hour and 20 minutes. 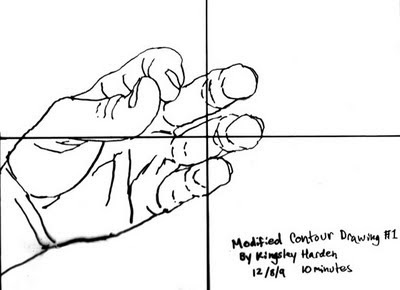 I focused on the lines of my hand like I did for the pure contour drawing exercise. I did these last night at the Art Directors Guild. 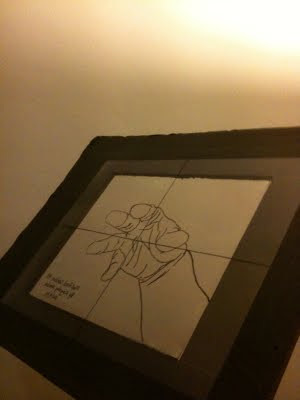 I clipped the frame to a table and put my left hand underneath and with one eye closed I traced what I saw with a felt tip marker. 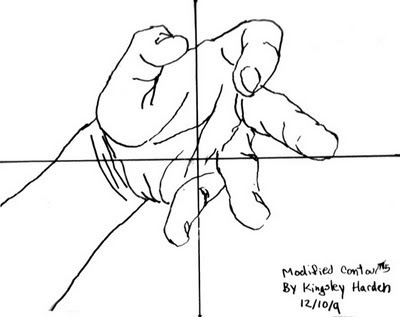 For this exercise I had to draw my hand while not looking at the paper. 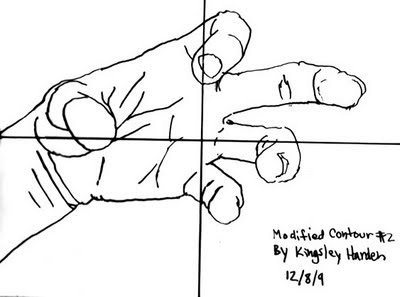 I squeezed my fingers together and stared at the lines in my palm. My eyes scanned my palm a milimeter at a time and my hand traced what I saw. This caused my hand to draw very slowly and precisely. I set an alarm for 5 minues so I didn't think about time (a left brain activity) for my first drawing, which was only a few lines when I was done. The drawing I posted below was done in 10 minutes and I was happily surprised by the results. While drawing my mind was in full right brain mode and I noticed the music I was listening too sounded like familiar sounds but I couldn't make out the words being sang. 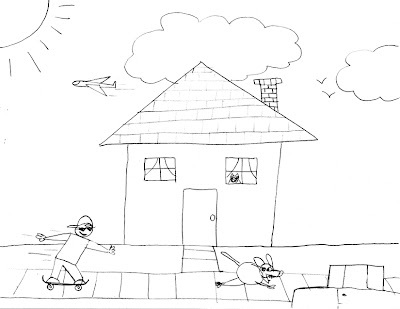 For this exercise I had to recreate a scene I would have drawn in my childhood. This exercise was meant for me to reflect on old symbols I used. I think I simplified my shapes more than I would have when I was younger. I had fun drawing this. 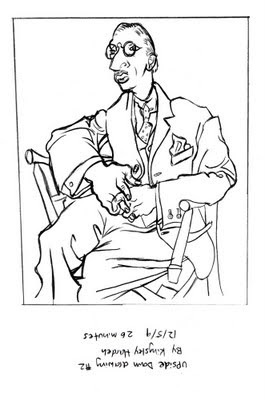 My next exercise is to do a "pure contour drawing." I have to look at my hand and drag my pencil across the paper to record my perceptions. I am not allowed to look at the paper as I draw for 5 minutes. The exercise is meant to keep me in thinking on the right side of my brain. I had to look at an upside image and draw it upside down for this exercise. 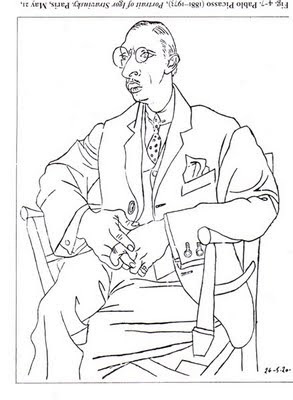 The point was to no longer think of the parts of the image as a hand or eye, but to look only at shapes and draw them in relation to each other. 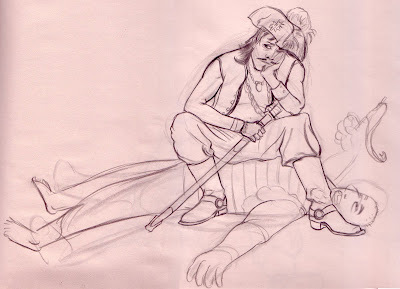 By drawing in this way I used my right brain almost completely. I know I was using my right brain because I no longer was hearing the music I was listening to and I lost all track of time. When I did switch to my left side of my brain I made mistakes in the drawing. I know I switched because I started thinking about the hands and the eye and how they function and fit on the forms. 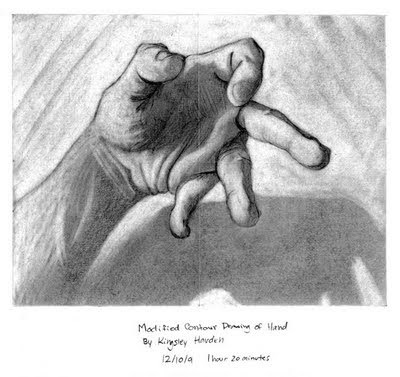 To think in that way is a left brain activity and since the drawing was upside down my left brain didn't understand the forms and the proof of my error is in the drawing. 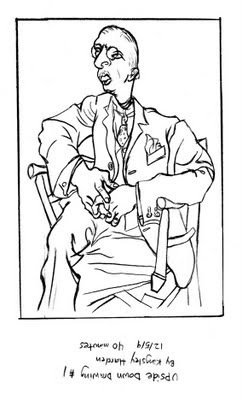 First, I will post the reference below, a drawing done by Picasso. The next two images are my 1st and 2nd tries. 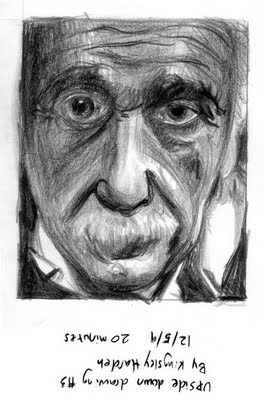 Below them is a photo of Einstein and my drawing. 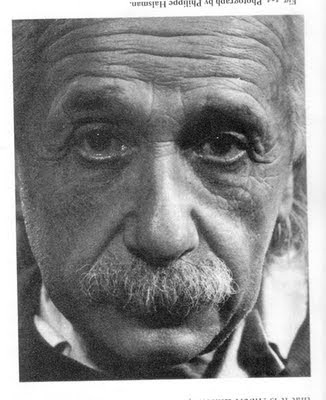 Just to clarify, The Picasso and Einstein photo were upside down on my desk and I drew them upside down on my paper. This exercise was to help me feel my brain switch from thinking on the left side to the right side. 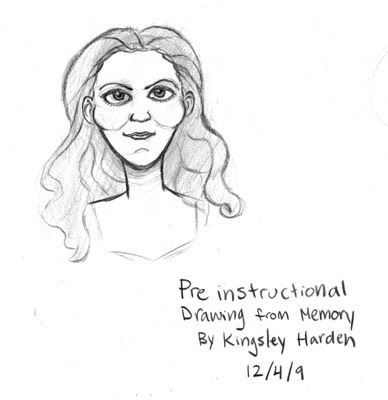 I had to draw a face on the left side of the page while naming all the parts of the face as I drew. 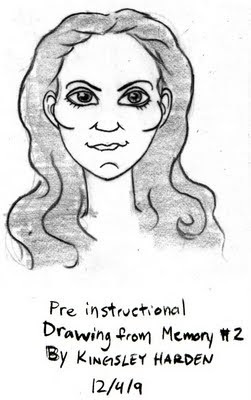 As I drew I said outloud "forehead, brow, eyes, top of nose, bottom of nose" and so on. After I was done the first face, I had to draw the same face on the right side, but looking at the other face. 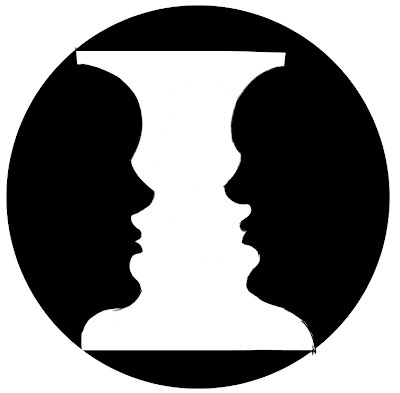 This creates an illusion, in my design class they called it gestalt, and if done correctly the image changes from a vase to two faces. The effect that it had on me while I drew, was that when I got to the forehead my pencil stopped and I had a strange conflict in my brain. I then continued to draw the face while not naming the parts any longer and my pencil didn't move as fluid as the first face I drew. The best way to describe how I felt was that my drawing didn't feel natural and I was trying harder. The version below is my 7th try. I added the black circle in Photoshop for clarity. This exercise was difficult for me. I'm used to using reference while working. I probably did 15 different versions of Alison. The top drawing I thought was successful until I looked at a photo of her for comparison. Once I saw her I had to start over and make the second version. For the second version I made a sketch, used tracing paper to trace it and drew different noses and mouths until something began to work. I think I cheated. Time to start on the next exercise. 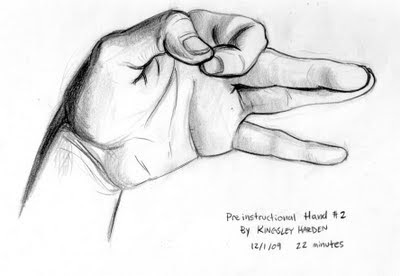 For my second pre-instructional exercise I drew two hands. I wasn't happy with the first one so I drew another. After looking at them both, I kind of like the first one more. 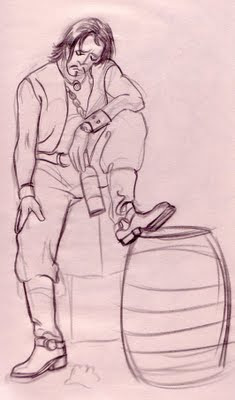 Though, I had more fun drawing the second. 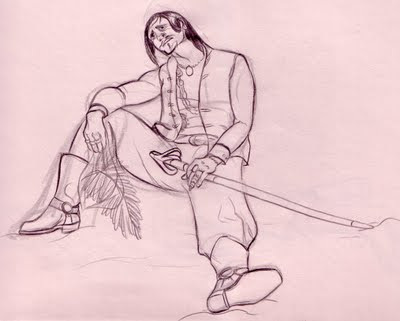 On the second drawing, I stuck a small pencil between my ring finger and pinky to hold that pose.